As one of the judges for the Lord Mayor’s Creative Writing Awards for this year, I’ve been surprised in the past 24 hours to hear myself referred to as a ‘professional protester’ by the Lord Mayor – an ‘arrogant liar’ who had had their ‘little self-indulgent moment in the sunshine’ and ‘caused at least $15,000 damage’ to City Square. 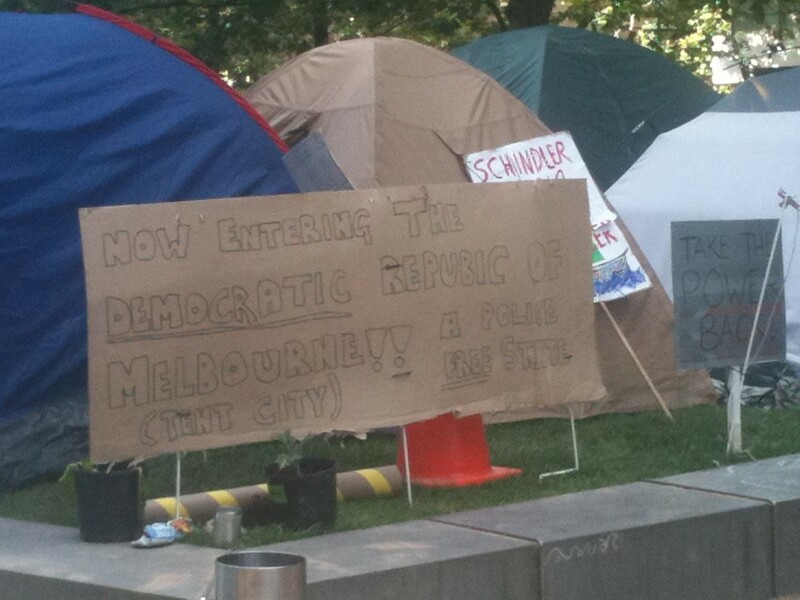 Because I have been active in Occupy Melbourne. I was part of the occupation yesterday that was forcibly evicted and I joined the post-eviction protest. I wonder, how I can be capable of deciding the best writing in Melbourne, while simultaneously fitting the above descriptors? 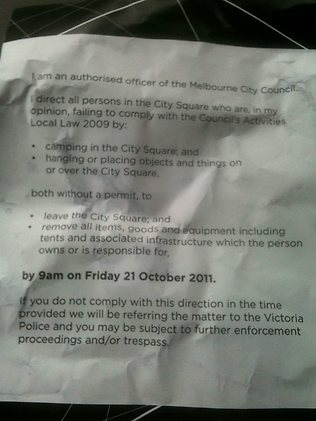 After notice of the eviction of Occupy Melbourne hit, the speculation was that arrests were imminent if protesters didn’t vacate the Square. I hadn’t been sleeping in the Square, in fact, I hadn’t even been there every day; still I was committed to the Occupy protest. Something was evolving in that space – in all the Occupy spaces – and it had a right to continue to evolve out in the open. I arrived on the corner of Swanston Street and Flinders Lane at 9.05. Police cars flanked Swanston Street, along with council trucks and a huge rectangular police vehicle that looked like an ice-truck. The visible police presence was moderate, despite the number of vehicles. I estimated about 70 officers in various hues of yellow and blue surrounding the cyclone-wire perimeter caging the Square. It was unclear whether they were actually planning mass arrests at that stage, or merely illustrating that was a possibility if they so desired. 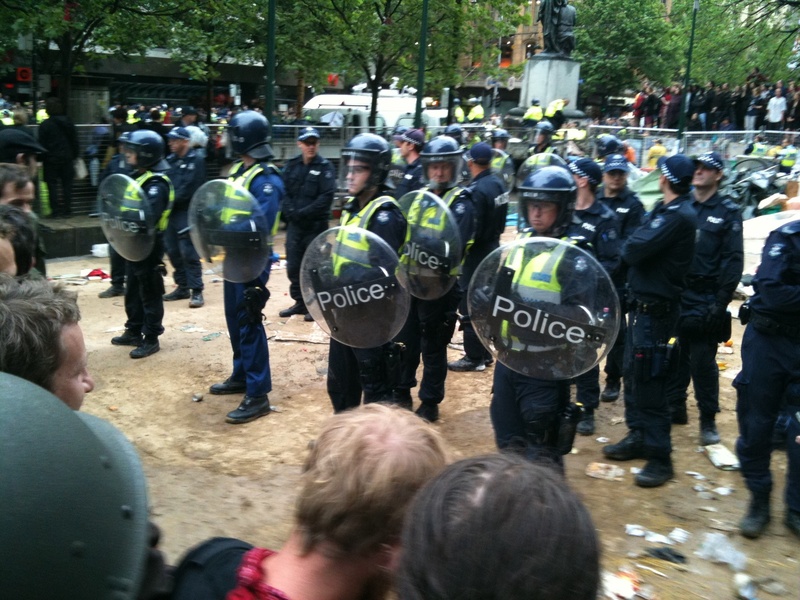 Most likely, their reaction would depend on the show of support for Occupy Melbourne throughout the morning. The sky was overcast, the ground was wet with morning rain and, despite the number of passersby paused, watching the fence erection still taking place across the road, I wasn’t certain how many more supporters would show up. The morning before, Clare and I had spent some time at ‘the Democratic Republic of the Tent City’, delivering scrolls and fruit for breakfast for the campers at the Square – a gesture of solidarity in a material sense. We’d admired the signs and the succulents. The camaraderie. Because City Square had been transformed by the Occupy movement. City Square used to be a public space. It used to be the hub of protest action, a performance space, a used space, where people sat and met and congregated. Long before those businesses that have complained about the occupation arrived – the ones I assume Doyle is referring to with his estimates of $15000 damage – protest happened in that space. But under neoliberalism, like so many other things that used to belong to the people, public spaces are marketised and really, in many ways, no longer public. While Occupy Melbourne was an action in solidarity with the thousand other Occupy movements around the world, it was also something else: a resistance to the idea that every space needs to be commercialised – a shop where you buy something or a space that will eventually charge you to rest your weary feet. That’s why I needed to get in the Square, and I did, by sidling up to the fence and walking past the security contactors at the middle stairs. I recognised a few faces, from other protests, but mostly I didn’t. The other occupiers spanned ages and ideologies. When it was clear that the police intended to use the kettling technique, a tactic perfected by London police, we moved into an odd triangle shape encircling the kitchen area, which we tried to defend as it had come to symbolise the collective nature of the camp. We tried to maintain a three-row deep line of protesters on each side, and we stood that way, rain falling most of the time, for almost three hours, as the camp around us was swept away. I stood, arms linked with the person either side of me, chanting for all that time in a standoff with an increasing number of Victoria Police. Some were missing name badges. Many donned rubber gloves and had their batons at the ready. Riot police arrived, in the Square and out. 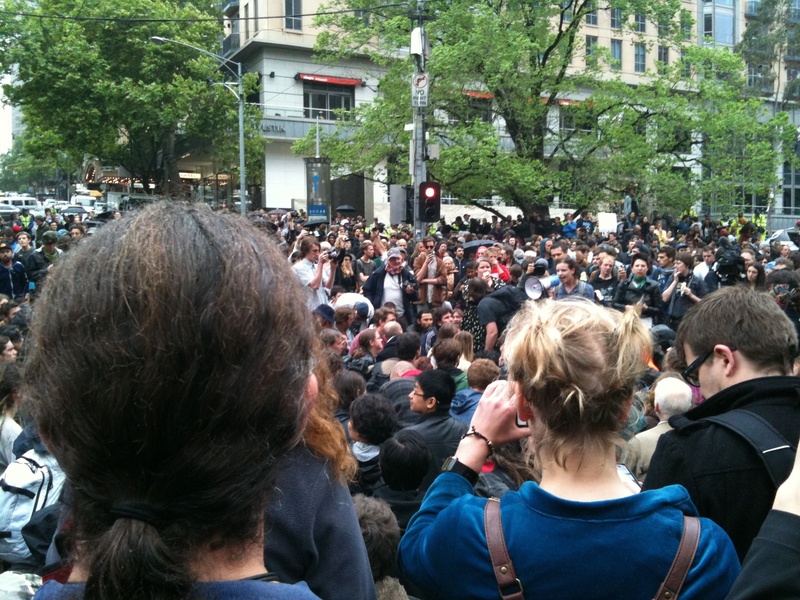 It was impossible to tell what was taking place outside your line of sight: mine was the row in front, the police behind them, the tentless space behind that and the growing protesters outside on Swanston Street. I saw the street protesters try to move the protest onto Swanston Street itself; I saw tactical response officers (in dark blue with blue caps) use legs and fists and batons to drive them back. I want to talk about the sense of solidarity among the protesters in that Square. Everyone there thought that camp meant something important and we worked collectively and – I must stress non-violently – to keep that small patch of square we had left. No-one attacked the police. No-one attacked each other. We continued voting. We continued our human chain. We used the People’s Mic (thanks OWS) throughout the occupation to convey messages and proposals. We also used it to sing ‘I will survive’, which I won’t forget in a hurry. But it’s hard to describe it in words. ‘It’s about poverty,’ said one. ‘It’s about greed,’ said another. ‘It’s about democracy and the right to protest,’ said a third. Aren’t all these things related? I think the people I occupied and marched with yesterday would agree that their vision of a democratic world is not one in which a tiny percentage of the world’s population is obscenely wealthy, while so many others go without. In a true democracy, I think they would agree, this kind of inequality wouldn’t exist. And in that true democracy, your opinion would be heard, just like it is in the Occupy camps when decisions are reached by consensus. We used to call something similar the anti-capitalist movement. While the Occupy movement is different in some respects, it shares the similarities above. We know how corporations make a profit and we don’t like it. Don’t get me wrong. In my opinion, a list of demands is essential. But when so many things seem broken, perhaps you just need a space where you can try something new. It was distressing when the lines of police moved in and started tearing fellow protesters from our lines. They were behind me and I had to keep glancing over my shoulder to see what was happening but it was hard because of the violent shoving by the police on both sides. But I saw those tactical police, working as a pack, some of them laughing as they targeted individual protesters, and I was afraid. Part of what was so shocking was that the occupation had been so peaceful, even in the standoff, and the contrast with the police behaviour was so harsh. Lucky for me, I wasn’t physically violated because at the last second, the younger occupier beside me and I opted to walk out, rather than be punched and dragged from the Square. It has been some time since I’ve witnessed this level of police brutality. Seriously, how much money was spent on the resources used on evicting 100-odd protesters from the Square yesterday? And how long will we be left with the ironic image of a fenced in empty public square? – which grew into the evening, with the backing of the unions and many concerned Melburnians have shown that. There’s a protest today to take back City Square. I’m guessing there will be a lot of people in the street. Brilliant article, Jacinda. Thank you. BTW, apparently it “cost” $150k. And add to that cost the 24-hour security they have guarding a fenced-in, empty public Square. Berwilliant. Thanks for being there. My heart is there, but my body is not. great article Jacinda, and good to get an update on the Melb situation. I’ve been to a lot of protests in a lot of cities and Vic cops are by far the worst in the country in terms of thuggishness. Reminds me of an interview I read with an organised crime figure, he said the cops in NSW weren’t a worry, you could buy them off, but the Vic cops, they just murdered you. Jacinda, fantastic article and sobering to hear about your experience yesterday. I keep hearing the same sort of question that Karl Quinn poses about the protests. It seems mainstream media commentators maintain their ignorance in spite of the evidence. First and foremost there are the enormous global inequities you refer to, but even in a wealthy country like Australia, the disparities should make the 1 per cent hang their heads in shame: the appalling over-representation of Indigenous Australians in almost every statistic that relates to poverty, malnourishment, lack of housing and education as well as severeley diminished life expectancy. There’s the growing number of homeless that we step over on our streets, people with mental illness who cannot obtain adequate treatment, statistics that mis-represent the real number of unemployed unless you want to count one hour as employed. Those same unemployed, often people with not much more than their body to offer the employer, are expected to survive on less than $300 per week. And what about the enormous amount of money that goes on funding private schools and private health funds and the money spent on wars just so we can step out on the stage with the US and let’s not forget Australia’s treatment of refugees. I could go on. Mainstream media was just as confused during the S11 protest and response to the protestors also mimics S11 – Special Operations Group (SOG) in full riot gear, badges off, gloves on and batons swinging – I totally lost my nerve for protests after that experience but I admire all those who were present for putting their bodies on the line. I can only think of one thing worse than the violence endured by protestors at the hands of the state yesterday, and that’s being Robert Doyle. Well said!! Occupy until REAL democracy comes I say. Whether you agree with the actual protest or not, it seems to me that there is something fundamentally very wrong with a police force being set against non-violent civilians. Democracy is a farce, when it comes down to it. Buck the system and pay, possibly with physical pain and fear: how is that democracy? And that’s before we approach the issue of how a Lord Mayor controls the state’s riot police anyway … Very glad I’m overseas and not in Victoria right now. Great account. I have added a link to this article and my blog article. I think that Robert Doyle (endorsed by Ted Baillieu’s silence) made a big mistake sending in police to break up a peaceful protest. And the silence is deafening. Yes brilliant thanks Jacinda. Good to have a view from the ground – from what I’d seen online and read from Sydney, the police action and aggression at the behest of the Lord Mayor was sounding beyond believable. Your report confirms it. Just come back from today’s rally which was spirited and sizeable (maybe a thousand or so). Certainly, yesterday’s events have done nothing to dampen enthusiasm for the #Occupy idea. Again, the police presence was extraordinary: cars, horses, motorbikes crammed into every alley and nook of the city. IMO, what we’re seeing now is the effect of the war on terror on domestic policing. A decade or so ago, it would have been unthinkable to mobilise that number of police for student demonstrations that were considerably bigger than any of the #Occupy events. Why? Because a consensus had been won that protests were legitimate. In the wake of 9/11, there’s been a concerted effort to demonise any dissent. We saw the result yesterday, when a small and peaceful demonstration was policed as if it were some kind of security threat. Mind you, that equation of protesters with terrorists never applies to right-wing rallies, even though historically almost all terrorist violence has been committed by the right. That’s interesting Jeff and I’m sure you’re right, as is Jacinda with her broader take on it re the neoliberal privatisation of public spaces – but why this OTT police presence only in Melbourne? Can it be, as some have suggested, really part of an (outrageous) attempt to ‘clean up’ the city streets before the queen’s arrival next week? That would do my head in. What’s the policing been like in Sydney? I mean, I know the thing hasn’t been attacked but have they mobilised huge numbers of police? I’d also connect it with the fetishisation of dead enemies: the exulting in the executions of Gaddaffi and his son, and the close up footage of their bodies. Again, it would never have happened fifteen years ago and seems to me symptomatic of a new brutality. The policing has been much less aggressive in Sydney. Apparently there was a minor episode today after I left the rally, with two arrests, but mainly the police have limited the camping equipment — no tents allowed. Minor harassment only. Lord Mayor Clover Moore wants the protests to move or limit their hours (i.e. no overnighting) but has also said she supports the movement’s aims. There was a big turnout today and some debate as to whether the protest should march through police lines (it had no permit) but sensibly people decided to stay put. I reckon 800 at the peak today, many workers and their families. Qantas engineers’ union rep and Steve Keen spoke from the front. Great vibe. 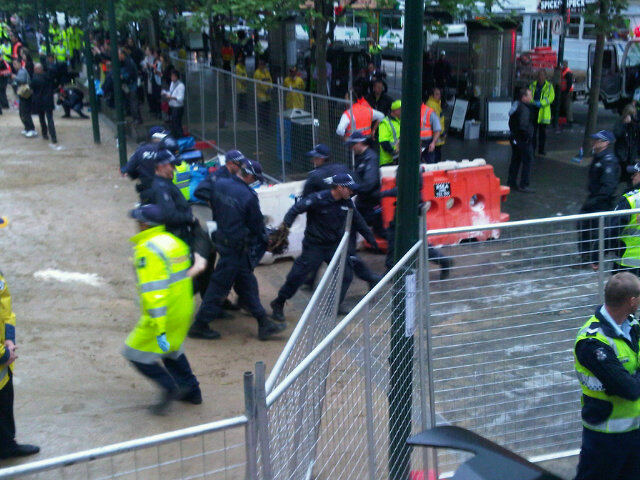 Twitter says that the police broke up Occupy Sydney in the early hours of this morning, with 40 arrests. Yeah, I’m just back from Martin Place. Seems I spoke too soon, the police arrived at 5am. All that’s left of the Martin Place Occupy Sydney this afternoon are 9 policemen keeping watch over about 9 protesters. But there’s a meeting at UTS at 5pm this evening. I’m certain that’s part of it. But it will be convenient for Perth police as well. If police quash the movements in the rest of Australia first, it’s going to make Occupy Perth easier to smash, and just in time for all those visiting heads of state. Thank you for a wonderful write-up Jacinda – and especially thank you for being there. The occupy movement is spreading as finally people are realising that all these things they have been protesting separately for so long ARE related. It has been terribly sad to see Robert Doyle make such a big mistake in responding to peaceful protest and provision of a public venue for open discussion and debate on any issue anyone could want to discuss with such overwhelming force and violence. I agree Kallena. Doyle’s made a Big Mistake. This is a great article Jacinda. I’m from the West, where the difference in family equity depends on who is renting/homeswesting/waitressing and who mines iron ore. It’s about time we had this conversation about greed and poverty. Thanks Sarah. 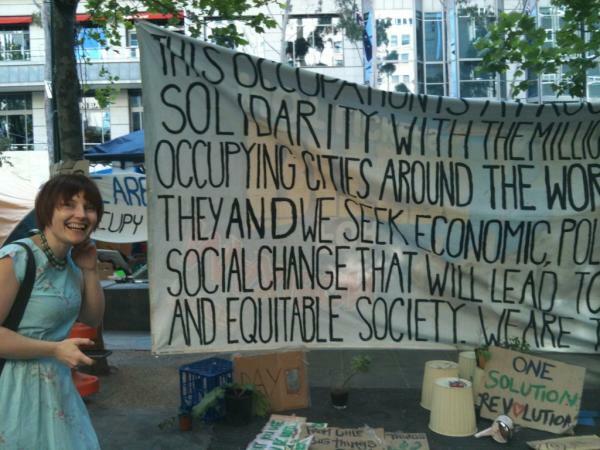 Actually, I’ve been wondering about Occupy Perth, which I know is starting to grow. I imagine WA will employ similar military-style tactics in the lead-up to CHOGM. ‘Some protesters appear to have been injured in the arrests …’ No big deal. WTF? With the talk of the Atlanta and Albany Occupy camps being evicted today, it sounds as though Australia’s leading the way in smashing protests movements. A proud moment. So it would seem that [like Jeff said] such brutality is totally justified in a post-9/11 world – that is, one in which we eradicate dissent. First off, a really interesting article. It’s always good to get a first-hand account of what happened amongst all the hearsay that gets passed around. Secondly, however, I think your account of the police brutality may be on the biased side, or at least not seeing the full picture. I apologize if this is a tad rambling, because I am not 100% clear in my own thoughts. I just thought it provoked interesting questions. What options did the police have? Also, why do the government not engage with protesters in order to reach a more peaceful and orderly resolution that doesn’t result in the major transport blockages in the CBD, but more importantly in numerous cases of police violence? Finally, if this were the case, would the protesters really disperse orderly? Or would they remain? I don’t really see what the problem is with leaving the encampment in place indefinitely. It would be a sign that Melbourne City Council actually did embrace diversity if they allowed the occupation to continue. I’m also somewhat sceptical of claims that small business was suffering and think any temporary dip in profit has been exaggerated and manipulated for political purposes by Doyle etc. Finally, the occupation was intended as a radical critique of capitalism and the state. Failing to vacate the City Square was the least of the laws it could have broken, in my opinion. Perhaps if the authorities had focused their resources on the white collar financial crimes that facilitated the GFC they could have removed the need for the protest in the first place? Just to add, if I am wrong about any of my facts, please correct me. As I’ve said, my views are not concrete, so I’m more than happy to be convinced. I was compelled to write a few words about the type of people involved in #Occupy as I experienced them yesterday, called “I was moved to tears today – TWICE”. Since the eviction many natives have expounded on Victoria’s Two days after the Occupy Melbourne eviction, it already seems surreal. Tourists were taking photos and schoolchildren and other bystanders were getting as caught up in the crush as the protestors. I was squashed until I couldn’t breathe breathe, hauled by the hair, pushed over and into obstacles, knocked to the ground and seized. I saw horses charged into crowds of peaceful people and faces red with blood and pink and shiny with pepperspray and tears. Many of the police maintained some kind of neutrality (to their credit) but others were laughing, jeering, and swearing at protestors. The idea that I might end up at the mercy of a group of snarling men is something I’ve had to consider. The fact that they might be in uniform and acting under orders form the government, isn’t. The police reaction radicalized my own, and I went back on Saturday, despite the fear and the fact that it had taken till well into Saturday morning for my hear to calm down. I didn’t mean to relate my own experience in such detail, but I already feel disconnected from it to an extent that worries me. I’ve been broodily and obsessively scanning through various online manifestations of that day and the Occupy movement in general. Something bad happened, and thanks to technology there are a million witnesses. But dissent is quashed every day and shocking clips on youtube are hardly uncommon. I wonder, does every video I watch (with the sound turned down) validate my outrage, confirm the choices I made, and the right to continue to refuse what I did not choose? Or do they merely leave me feeling distanced and ever-more resigned. 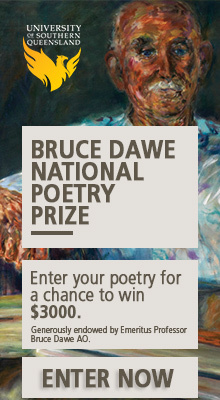 Either way, thank you for your article Jacinda, and the Alice Walker poem – it bought a shine back to my eye. As a fellow Melbourne citizen, I feel embarrassed and outraged by the actions of the mayor and his police force. I’m so sad and sorry to hear stories of trauma such as Gabrielle’s. The question of the effect of the images radicalising/desensitising is a really good one. I must say, in my experience here at home, some of the on-the-spot footage of the eviction and my own photographs of Saturday’s rally, have made family members & friends who weren’t there rethink the accounts they’ve read/heard in the mainstream news. Rethink and be shocked and saddened and made angry. You’ve raised some unsettling points, Gabrielle. Thankyou. I wanted to write more about the violence, but couldn’t seem to get it down. This interviewer is unbelievable. Well done managing him, Mr Goudkamp. Thanks for this great article. These accounts are very valuable. Hi Jac, Thanks for this great article. These accounts are very valuable. My gratitude to Jacinda, and others for reporting their experiences here and to every other protester who has been brave enough to ‘go there’, to say something, to be there, to try, to see, hear and feel as a human being, to risk moving toward change. I didn’t arrive at the protest on Friday until the occupiers had been moved out onto Swanston Street. The level of police aggression shocked me – and in response to such a positive, and indeed family-friendly, movement. That the police removed their nametags seems to say a lot about how seriously they took their accountability. It’s regrettable that as tensions rose, events became increasingly violent, but from that video, it was the police, not the protesters, who introduced the climate of intimidation and anger. So much for the right to expression and assembly. P.S I think I recognise in that video the guy from Q&A last night who asked that question from the bath! Thanks so much for your article Jacinda and for including this clip. It really is devastating to watch. I can’t help saying to myself (naively perhaps) is this really Melbourne? Thanks for your inspiring (and maddening re police – smashing beer bottles?!) report from the rally, Diane. I think your ‘people before profits’ says it all. Sadly these “Occupiers” are foolishly wasting their time. No movement has ever stopped corporate greed or war in the last 50 years. The anti-Vietnam movement got nowhere until the US was defeated in 1975 by the third world nation & sadly the “Occupy” movement will never change things with corporate excesses or the fact the USA corruptly spends 48% of all of the worlds military spending on deadly weapons of mass destruction whilst it currently supplies nations like Pakistan & Lebanon which then accusses of terrorism. No movement or anything can change what is behind or happening in this world. The “debt” held by European banks, European nations is beyond return as these institutions face further ratings “downgrades” which have never been seen before. The same situation faces Japan & the United States with massive “debt” & further downgrades. Total collapse of the European banking sector & economies of European nations is inevitable, the riots seen this year in Athens & London are nothing compared to violence that will erupt across Europe when its economy totally crashes soon. There will be thousands of deadly riots across Europe & this crash will have a “dominoe” effect as global stock markets collapse. This will have the total economic collapse of Japan & the United States of America as thousands of deadly riots erupt across those nations & the world as the next “Great Depression” ushers in, which will be much worse than anything seen before. This will also have catastrophic consequences for volatile regions like the Middle East as Islamic extremism erupts across that region from the rise of poverty. This will see wars erupt along all of Israels borders. This will have Israel/NATO go to war with Iran & most of that region in a full scale Middle Eastern war. This will see “OIL” Prices skyrocket & world economy crash further into the abyss. Any war involving Israel & Iran will turn the entire Middle East into a region of full scale war. This will also have unimaginable consequences as trade shipping routes(OIL & GAS) like the Suez & the straits of Hormuz are heavily affected & have nations like India,Russia & China drawn into this full scale Middle Eastern war. In the last few years the US Navy has built up in the Persian Gulf & this year two firsts happened. The first was Iranian warships were allowed passage through the Suez canal for first time since the 1979 Islamic revolution of Iran & the ousting of Mubarak in Egypt earlier this year to sail to Syria. This makes the 1979 Israeli-Egyptian peace accord defunct. The other thing was China sailed a warship to the Mediterranean for the first time ever just of the coast of Libya which it is a major trading partner for “OIL”. This inevitable worldwide economic collapse will trigger off a sequence of events truly unimaginable to most. This will see wars erupt the across the Middle East, terrorism erupt worldwide which could be either biological,chemical or nuclear. Deadly food riots will erupt worldwide. There is also volatile regions like that between Pakistan & India which are both nuclear armed nations. Pakistan is the only nuclear armed Muslim nation which has been under siege from extremists who this year raided a naval base. The possibility of extremists over running that nation & acquiring nuclear weapons is fast becoming a reality. India still blames Pakistan for the terrorist attacks on its soil in Mumbai in 2008. Then there is Korea & recent hostilities there from last year, the next lot could trigger full scale war on the Korean peninsula & this would have catastrophic consequences given its proximity to both China & Russia. No movement can turn this back as the rate of events are rapidly speeding up with the worlds economic woes unravelling along with the unrest of the Middle east with the Arab spring & violence in nations like Syria,Libya & Egypt along Israels expansions into Palsetinian lands along with continued threats towards Israeal only fuel the cycle of madness in that region. Worldwide economic collapse is inevitable & sequence of events that will follow that will be truly unimaginable & apocalyptic are inevitable as well. My experience was much the same. I walked into the square just before 9am. There was no attempt to stop me as I walked past the private security guards and the police. I think shortly afterwards access was blocked. The feeling inside the Square was great. But the tension quickly mounted. Several young people, mainly young women, looked at me and kept asking ‘Are you ok?’ I must have looked a bit worried but as a veteran of more than 40 years of political activity I guess I knew what was coming. But the fact that these young people will more concerned about the condition of someone else rather than themselves is a strong confirmation of their courage and committmet. I watched on with admiration as the young people stood their ground and did not respond to the police violennce. By the time the first two rows had been removed I decided to walk. Being indifferent health I didn’t want to risk any real damage. When I arrived just outside the square there was a young guy slumped on the pavement. The police seemed to show no concern about his condition. Along with two young women we picked him up and took him across the road. He said he had been hit in the face a couple of times. And the violence continued after they had cleared the square. On the march that afternoon the police were extremely aggressive in pushing people in the back to keep them moving. But whatever happens in the next period we have had a moral victory. But I fear as the crisis in our society deepens these tactics will become more common. So much anger…how, exactly, would you change the world? So much to complain about…so few opportunities. How, exactly, would you rearrange the world? …..I opted to tiptoe out….. What solidarity! Actually most of these people have jobs and when you have been camping for a week showers are a bit hard to come by even in the middle of a city! Wake up and pay attention to the message…. Thanks for the article and comments. I am an Aussie now living in France, and read Jeff Sparrow’s post in Counterpunch. Having been on dozens of demonstrations/marches from the Vietnam War days, I remember the behaviour at times of the Sydney police, who were not sympathetic, but at least we could march. Privatisation has taken so much of public space that I was heartened to hear the comments of the Occupy Melbourne stalwarts. All the best to you all! We shouldn’t be surprised by the Victoria Police response, they have always been the Whores of the Political System and NOT upholders of any written law! In 2000, I experienced the wonderful action of the Victoria Police in wrongfully arresting me and Stealing all my worldly possessions, at the behest of the CSIRO and other unknown entities! Any idea that Victoria Police upholds a law that benefits the community is abhorrent and a LIE! I support this protest wholeheartedly, but will not be there in person as I may not be able to contain myself if a police officer uses violence against me. ha ha, i only wish i could have seen it with my own eyes, what do you idiot protesters think you are going to achieve. you are just like little kids in the playground crying because another kid has a better toy than you, its not fair boo hoo. people are rich because they know how money works and what they have to do to get it. just because you want everyone to be equal does not mean that everyone should be. if you could erase everything and make everyone equal today im sure it wouldnt take long for everything to return to its present state. You might find my questions about how to get the police “on side” interesting though – or at least a slightly different perspective. I feel for the police – they are part of the 99% too! So I am scrolling through 61 comment to say this made me cry. That is all. Both the Guardian and Boing Boing are covering the aftermath. Btw, the person hit with the tear gas canister is in a critical condition. He was an Iraq War vet and a member of IVAW and Veterans for Peace. Why don’t they get it? Occupy said non-violent. That means both sides. Did the fact that the overwhelming majority of the brutal police where ‘White Anglo’ reasonate with anyone? I myself fit that description and am sad that they are helping to reinforce the white-brutal colonial stereotype that plagues our society. Dont worry too much about the media. The Herald Sun will try to kill with red neck ranting and The Age with liberal irony. Let a popular alternative to the present corrupt political system and its enforcers emerge, it will not be easy but let us fight for it.